Many a critic has commented on the queer sensibility of Hollywood director James Whale. His horror films have often been read through his own homosexuality as allegories and campy commentary on gender roles and sexuality. Frankenstein (1931) is the tale of outsiders, and what are LGBT individuals if not historical outsiders, misunderstood, mistreated, and often ostracized from mainstream society? 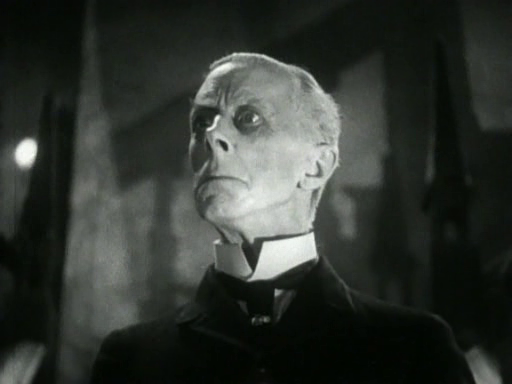 In the sequel, The Bride of Frankenstein (1935), Whale amped up the camp by featuring his dear friend, flamboyant British stage actor Ernest Thesiger as Dr. Pretorious, whose delight in perversity and a rescripting of the meaning of life and love leads to the creation – with the tormented and then blackmailed Dr. Frankenstein (Colin Clive) – of the most iconoclastic female figure in all of Universal Studios films, the Bride. She is “woman” as conceived by a flamboyant, effeminate (gay) man – a sort of monstrous patchwork drag queen. One need only Google “Bride of Frankenstein gay” or “camp” to uncover many an engaging reading, including Gary Morris’s “Sexual Subversion: The Bride of Frankenstein” and Jeff Saporito’s “Why is ‘Bride of Frankenstein’ often analyzed as a gay parable?” On the big screen, the subject is also compellingly explored in Gods and Monsters (1998), a dark film about life, lust, and fantasy starring Ian McKellen as James Whale in his final days, engaging with his mental and filmic monsters in compelling and troubling ways. 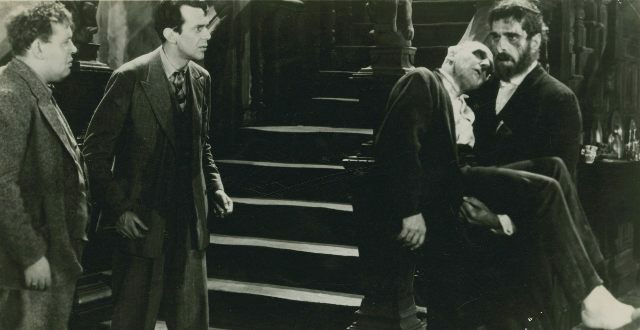 Lesser known than the two Frankenstein films directed by Whale and filmed between them is The Old Dark House (1932), another Universal horror inflected with queer camp that certainly inspired The Bride of Frankenstein and perhaps The Rocky Horror Picture Show (1975) as well. A stormy night brings five seemingly straight-laced characters to the titular old dark house, a sinister mansion where the weather proves to be the least of their worries. One by one, we are introduced to the members of the creepy household and as the night wears on, things get queerer and queerer. 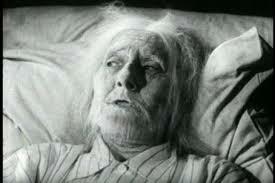 Like Bride of Frankenstein, Old Dark House features Ernest Thesiger as Horace, the seeming elder patriarch of the family. He brings his usual effeminate flair to the role, beginning with menace and morbidity and ending in campy absurdity. We soon learn that the house’s owner is not Horace but his sister, Rebecca (Eva Moore), a hunched, hard-of-hearing spinster who finds the unwanted guests even more offensive than her brother. Even when she acquiesces to their staying the night, she shouts “No beds!” repeatedly, forbidding them access to private chambers. 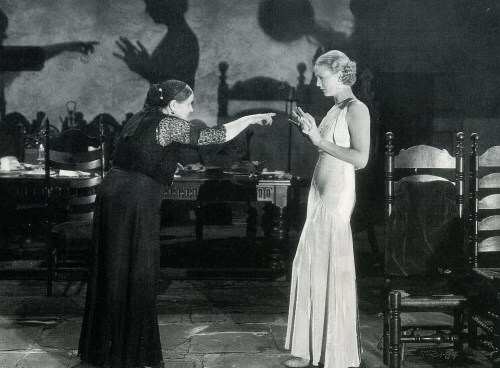 In particular, Rebecca dislikes Margaret Waverton (Gloria Stuart), a young, married blonde who immediately attracts the attention of the house’s mute brute of a butler, Morgan (Boris Karloff). When Margaret changes out of her wet garments into a clinging satin gown, Rebecca lets loose with hysterical scorn, accusing the young woman of sinful (lustful, seductive) behavior. Later, we discover that the younger sister of the family, Rachel, was murdered in her bed, and we can guess that this was the end result of Rebecca’s wrath. Lesbian (and possibly incestuous) desire becomes a tempting interpretation for Rebecca’s excessive judgment, especially when we watch her close in on Margaret to finger her gown in ostensible disgust, denouncing its soft, sensual feel. Is it wrath or desire that moves Rebecca? The most delightful member of the family for those invested in queer readings is Roderick, the true patriarch, who is banished to his bed. When the visitors steal up to meet him, they receive a warning, but we receive even more as viewers. It is not difficult to figure out that Roderick is actually being portrayed by a woman in male drag (Elspeth Dudgeon, credited as John Dudgeon). Roderick’s voice is femininely high, and despite the wispy beard, his face looks entirely female except for a prosthetic nose. Because there is no textual reason for this casting, we are left with a surprising trans moment. Of course, it helps that the family surname is Femm. Finally, no discussion of The Old Dark House would be complete without mention of Karloff. While top billed, Karloff played the aforementioned secondary role of Morgan, the family servant. He is said to be dangerous, and his mute, leering presence brings a sense of horror to his scenes, especially as he openly ogles and later attacks Margaret. There is heavy-handed predictability to the character. Unlike the sensitive, childlike creature of Frankenstein, Morgan is animalistic and volatile. Nevertheless, in Whale’s hands even Morgan has a queer edge by the conclusion of the film. It turns out there is one more brother in the house, the mad arsonist Saul (Brember Wills). Although he claims he is sane and that Morgan beats him, the opposite turns out to be true. He attempts (not for the first time, we learn) to burn the house down around him and must finally be killed to stop him from murdering the houseguests. The surprise comes when Morgan discovers Saul dead. Taking the body into his arms in a bridal carry, Morgan takes him away up the stairs, clearly mourning. Perhaps, in the end, his attacks on women were a smoke screen. Saul was clearly dear to him in ways the women were not. The Old Dark House will likely never find the adorations fans have for Whale’s two Frankenstein films. Nonetheless, for those seeking queerness in classic Hollywood, this low-budget delight may offer an even more delightful experience.